BuzzCanada: Announcement: Beyonce set to drop a new secret album? Announcement: Beyonce set to drop a new secret album? There are rumours that Beyonce is about to drop a new secret album, a year after she pulled the same stunt. 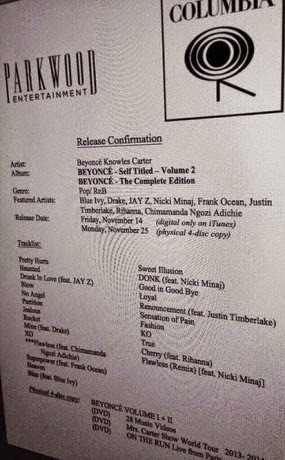 The rumours started after a piece of paper (pictured right) with logos from Beyonce's Parkwood Entertainment and Columbia Records with info about featured artists, date of release (Nov. 14th), was leaked online. Beyonce's camp have neither confirmed nor denied the rumors.